Ok, I am finally upset enough to come here and post a review about my MES 40 Smoker. That’s kind of a nickname it has gotten over the years. It should really have been “piece of crap”. 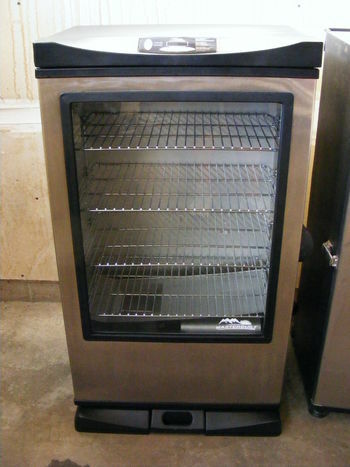 The smoker I am talking about here is the 40-Inch Front Controller Electric Smoker with Window from Masterbuilt. I just recently bought a two probe digital thermometer so I can measure the meat temperature and the oven temperature. Now, I am thinking: “Why in the world did I just do that?”. I bought a smoker which should have been able to do those things for me. That was the whole purpose. It can’t. THE TEMPERATURES ARE OFF!! It’s off with anywhere between 20 and 60 degrees and it varies depending on the current temperature so you can’t just consistently add or subtract a temperature to fond the correct result. This smoker has a built in thermostat that keep the inside temperature at whatever temperature you set it to. It also has a probe inside to insert into the meat so you constantly can read the meat temperature on the display. Really cool, right? Yes, if it worked. So you may ask why I didn’t return it or had it repaired while I still could. Well that is simply because I wasn’t aware how severe the problem was before I had used it several times. When I finally went to check the internal temperature and the temperature read from the meat probe, with a whole range of other thermometers, then it way past warranty expiration. So that was my MES 40 review. I’ll ditch it as soon as I find something reliable. I still want electric, just something I can trust. This entry was posted in BBQ. Bookmark the permalink. ← Amazon Products – How Weird Can it Be?